I actually made this the other day for my parents. I had to give my niece piano lessons soon after it was done cooking, but I figured I would be able to have some and take a picture of it later. When I got done with piano lessons, however, this is what I found. 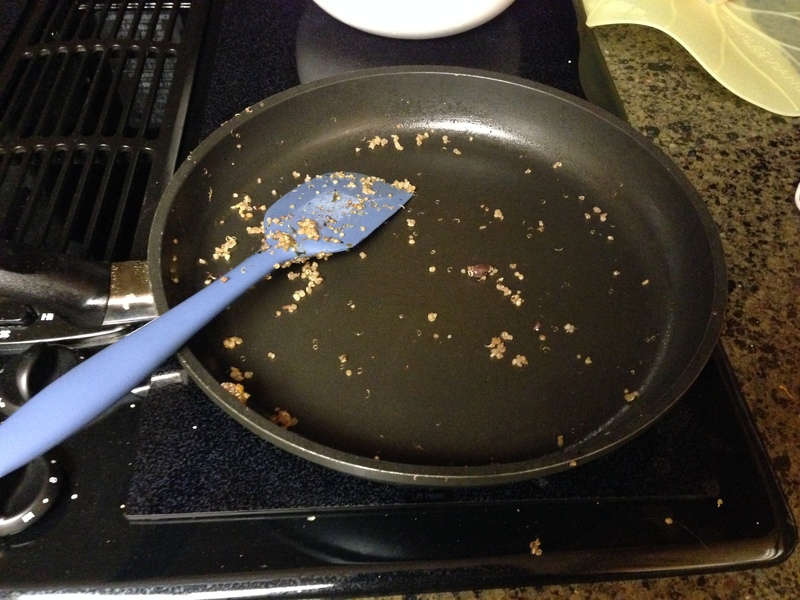 According to my mom, my dad wasn’t too keen on having quinoa for dinner, but he ended up having 4 helpings (hence the empty skillet). Consequently, I had to make it again, but this time I took a picture immediately after it was done. 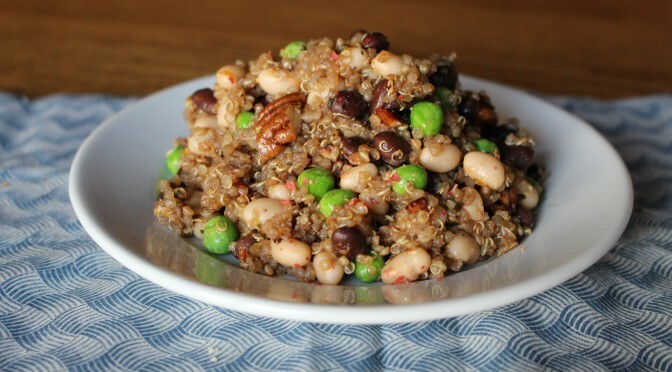 So I know that I have had a toasted quinoa dish before, but this one is a little different. This is one that uses ingredients that I always have on hand and that I would guess most people have in the pantry. Put quinoa in a dry skillet over medium heat. Cook until quinoa smells toasty and begins popping (it should sound like a geiger counter found uranium). Once toasted, carefully pour water in, and stir in 1/2 teaspoon salt and dried basil. Bring to simmer, cover and cook for 15-20 minutes or until all the water is absorbed. While quinoa is cooking, mix together vinaigrette. In a small bowl, whisk together oil, balsamic vinegar, honey, mustard, and salt. 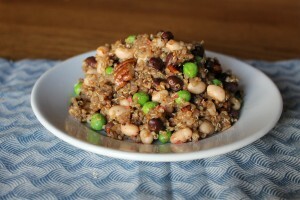 Once quinoa is done cooking, turn off heat and stir in vinaigrette, pecans, and peas. Serve warm, at room temperature, or chilled.